The shoulder is the one structure that relies on all major areas of your spine for proper function – your neck, your upper back and your lower back – so it’s one of the most chiropractic-relevant joints too. Nerve supply to the shoulder and arm originate from the neck. As a result, any conditions that irritate the nerves as they exit the neck, such as spinal misalignments, can cause symptoms in the shoulder, arm or hand. Disc bulges, joint degeneration and inflammation, as well as vertebral subluxations can all cause nerve irritation in the neck. If any of these conditions are causing shoulder pain, chiropractic adjustments can help ease soreness. The shoulder blade (scapula) is the bone that contains the socket of the shoulder joint – also called the glenoid fossa. Since the shoulder blade rests against the ribcage in the upper back, irritation or improper positioning of this area of the spine can cause dysfunction that directly affects the shoulder. Rib subluxations and vertebral subluxations are very common in this area. Thankfully, both of these conditions are easily correctable with chiropractic adjustments! A little known fact is that your shoulder directly connects to your lower back area via a muscle called the latissimus dorsi. This muscle is one of the prime mover muscles of the arm when used in any pulling motion. If your lower back is painful or dysfunctional, your latissimus dorsi can become affected, leading to shoulder restriction and pain. Also, shoulder issues can influence the functional balance of your back. Therefore, it’s important to have your entire spine checked by your chiropractor, even when your symptoms are located in a single joint like the shoulder. 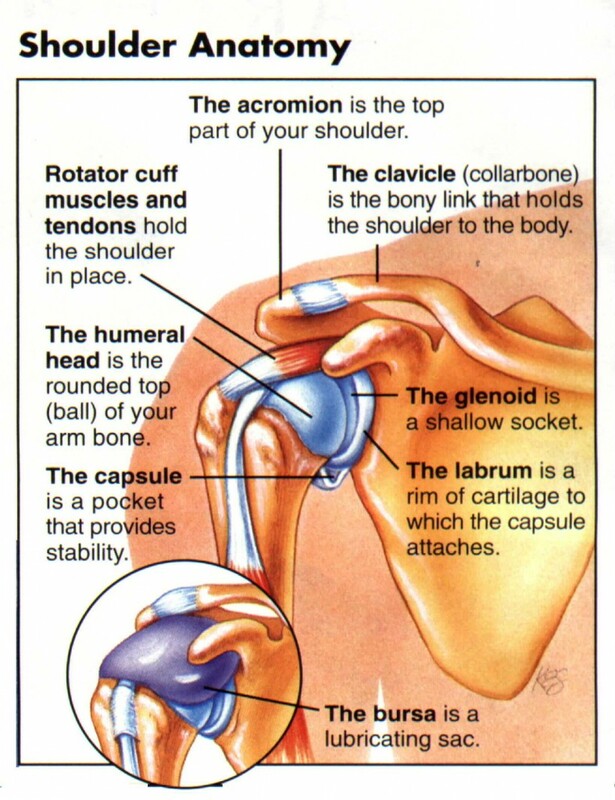 The shoulder joint is classified as a ball-and-socket joint, making it one of the most mobile joints in the human body. However, unlike the hip joint, the socket of the shoulder is very shallow, making it structurally more unstable. This instability requires an intricate system of muscles (rotator cuff) to support it. Subscapularis – the strongest internal rotator, this muscle is most commonly the cause of painful rotator cuff syndromes. Unfortunately, these muscles are called upon to perform two functions: stabilization and movement. This leaves the rotator cuff more prone to stress and strain, especially when the shoulder position is compromised by poor posture or repetitive movements. Rotator cuff problems are typically the cause of numerous shoulder symptoms like bursitis, tendonitis, shoulder impingement or peripheral nerve entrapment. Your chiropractor can test for each of these conditions and, if found, will suggest the best treatment options for you. Good alignment is the starting point for proper function of any joint. The shoulder is no exception. With the susceptibility for the shoulder to dislocate, this makes proper alignment of the shoulder even more important. The length and strength of muscles around the shoulder joint determine the shoulder’s structural integrity. Statistics show that computer usage is increasing dramatically. Internet use in the household has increased from 18% in 1997 to 62% in 2007. Many of us are guilty of spending hours sitting at the computer in poor postural position. This can lead to a situation whereby the muscles of the chest and front of the neck are shortened, and the postural muscles of the upper back are lengthened, putting them in a weakened position. Over time, not only does this lead to stress and strain of the postural muscles around the neck and upper back, but it also places the shoulder joint slightly out of position. As a result, every movement the shoulder experiences in this faulty position increases the wear and tear on the joint and makes it vulnerable to arthritic changes. Muscle imbalances often lead to shoulder joint problems. Pay attention to your posture, and be sure to exercise and stretch the muscles of the shoulders to maintain proper balance and shoulder position. Shoulder problems are complex. They can be related to every major area of your spine – lumbar, thoracic and cervical. Be sure to have your spine checked regularly to maintain proper alignment and biomechanics. If you have a history of shoulder problems or are experiencing any pain or discomfort, please contact our location nearest you today and we’ll help you heal as quickly as possible.